WMMT FM and Scalawag hosted a community discussion about issues in media coverage of Appalachia. They shared ideas and examples of ethical, accountable, community-led media projects in the region, discussed some less ideal national coverage Central Appalachians are well-acquainted with, and created a guide for journalists on what to do and what NOT to do when covering our mountain communities. The forum began at 11am and end at 2:30pm on March 31, 2018. 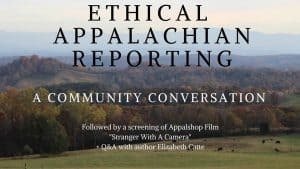 Directly after the forum, the organizations screened Appalshop film Stranger With A Camera, directed by Elizabeth Barrett, followed by a Q&A with author Elizabeth Catte about her new book, What You Are Getting Wrong About Appalachia. For more information, read “Telling Tales: How The Media Fails Appalachia” published in Scalawag Magazine. This event was made possible thanks to the PEN America’s Press Freedom Incentive Fund.